Because it's not the same river, right? But it's a river all the same--another river, or the same pebbled bank on a different day, or the same water, further down stream. I recently participated in a writing workshop with Gary Soto--even better, I went as my daughter's guest; a workshop spot was part of her winnings in a local writing contest. One prompt asked us to write about a river journey, point A to point B: what do you see? I see the Red Cedar River, Mother's Day in Michigan and hot, our first big spring outing of the year. Just being outside, doing something outside: that's my mother's present. We're old enough to paddle two canoes--one kid, one parent each--up from the university rental dock. The turtles are out, the spring pollen is itchy, but here's the rub of memory: what I remember most are the turtles, baking their shells to summer hardness on logs or rocks, and the four of us in our hollow aluminum logs, burning rather than basking, because who remembers sunscreen, the second week in May? But were the turtles really out, so early in the year? I'm brought up short. 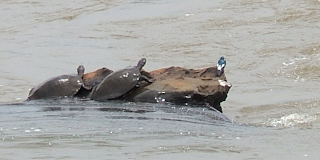 We canoed later on in summer--maybe that's the source of my persistent memory of turtles. I can't think of the river without them. The scents I remember are the sweet sneezy haze of spring and the mildewed sigh of the orange lifejackets, also from the rental barn, last summer's damp that never dried out drawing a still underlayer to the spring heat smell, the drying mud. I haven't been on the Michigan State campus in years; I don't know if the canoe rental's still in place. But that was the first river that came to mind, like a slide flashing up on a wall of the library conference room. No need to elbow aside other, more recent rivers. They weren't even overlaid, one image crossing another. But now that I'm thinking about rivers, I'll list a few more: several times a week, I run beside the grandiosely-named Amazon Creek. That's not a river, I know. Once the rains really stop for summer, it will be scarcely be a creek. But the water's cloudy as milky tea after a storm, it sloshes against its banks, tempts nesting ducks. Point A to point B, I'm on the towpath, not navigating, but the watercourse suggests a route. 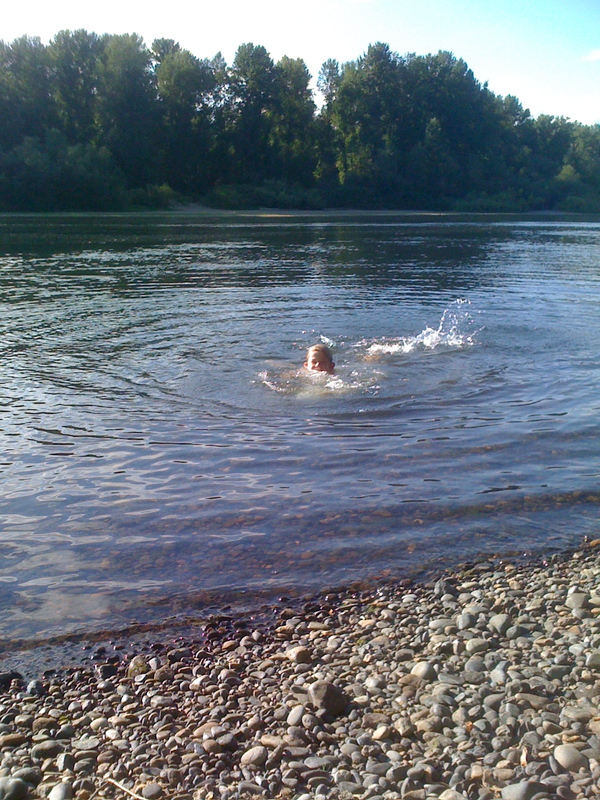 Then there's swimming with my son near the ferry docks further north, or watching the fast, empty cereal ships cruising up the Paraná. 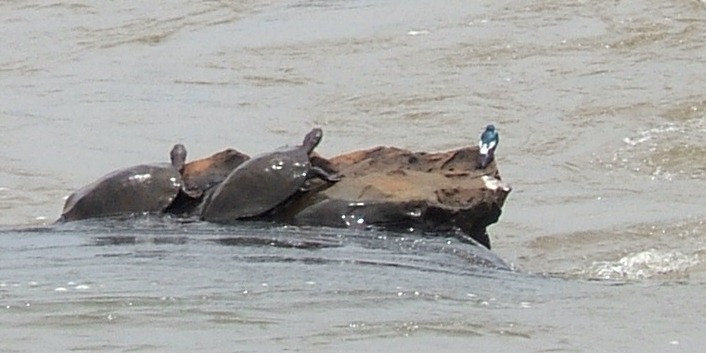 Most recent basking turtles: just above Iguazú Falls in November. I was even there with my mother. I pulled out my little workshop notebook (more treats, more prizes), looking to retrieve that first river version. Like any revisited, reopened manuscript, it's a little different than I remembered. Some images are clearer, others are vague. It's a river all right, but it's not the same one. Still, it's what I have to work with. I'll just dip in a toe--over here, where the murk starts to clear with the current. Lucky you to have such a daughter, and lucky us to have you. Every single one of your posts makes me want to go off and write, and this is one is no exception. I might just have to spend the rest of today remembering and writing about the rivers that have been a part of my life. I am lucky, indeed--and lucky to have such a reader as you. I hope I did send you off down the river memory path today, and that I'll one day get to read what you wrote.